1. A new time change. Cairo was 6-7 hours ahead of home. Now, I’m 12 hours ahead, which is basically an entire day. I’m ahead of London by 7 hours and Cairo by 5. I feel like I’m leading a race. 2. A new exchange rate. Cairo’s 7.8 LE to the dollar was the relatively stable rate this past year, and it was the topic of most conversations between my American colleagues and me. (Flashback entry on that to come.) Here in Manila, it’s 45 pesos to the dollar, which is not as easily divisible as 7. 3. Shorts!!!!! Finally! My pale, vampiric legs and shoulders can emerge after four years of hiding under shawls. I no longer have to dress like Gandhi when I’m walking down the street. The best part is, no one cares. Sure, heads will turn. (Obviously.) But I’m not hearing the constant, “Oh my Goddd” as I stroll by draped in scarves like a moving curtain display. 4. Humidity. I was warned to prepare for humidity immediately upon exiting the airport. I imagined stepping foot out onto the city street and being blasted with a wave of humidity that would practically soak my face and leave my hair frizzing out a mile off my head. This has not happened. It could be because this is the rainy season and it’s a little cooler, but right now, I’m doing okay. Also, I was told to leave my makeup in the States because makeup + humidity = raccoon eyes. Not so! My MAC gel eyeliner and I are having the last laugh. Ha. 5. High rise living. I miss having the stairs as a viable option of getting up and down. The plus side is that my apartment’s altitude makes burglarizing difficult, unless you’re Batman. The down side is if there is an earthquake…well. You get it. 6. Weather. Cairo did not have weather. Apart from the occasional “rain” that would cause traffic jams lasting for hours, and “dust”, which was just a pain for allergies, Cairo did not experience weather. 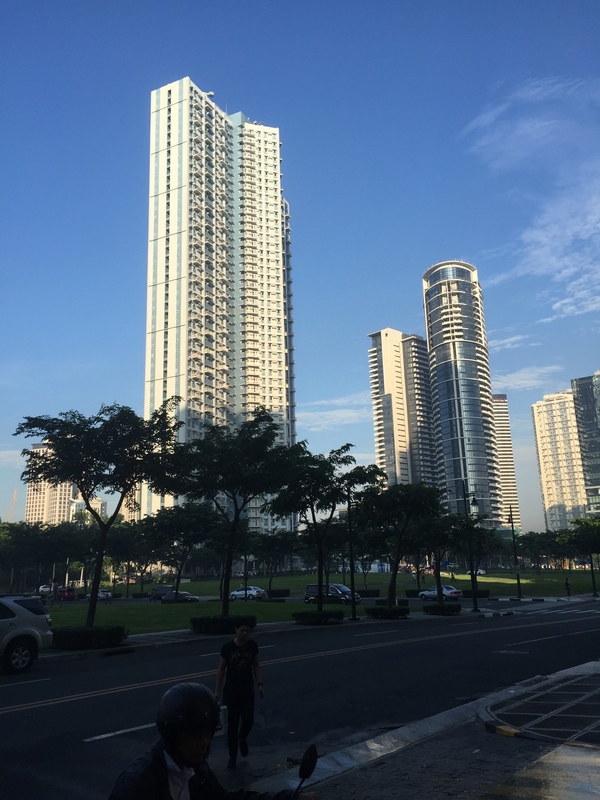 Manila, on the other hand, is located in the Pacific Ring of Fire, which means it experiences volcanic eruptions and earthquakes. Oh, and typhoons. 8. The school. Holy crap. There are no words. First of all, I can walk to school. Any time I feel homesick for Cairo, I need to remember this. My school in Cairo offered me a very bearable 25-30 minute commute by bus. Most other schools, including my first one, were 40-60 minutes on the way home. Unless it rained. Then it could be two hours. One time, we got out and walked from the Autostrahd exit to Maadi. So hooray for walking to school. So do I. There are three gyms. There is a PE class that combines exercise with sports learning or something and involves spinning bicycles with mounted desks so you can bike while writing. There’s a robotics lab. There are dance studios and fully equipped gyms. There’s a tennis court on the roof. A swimming pool. And – my personal favorite – private, soundproofed music practice studios in the music hall. The cafeteria offers vegetarian and vegan cooking for students. That’s right. Vegan options. I mean, I’m comparing this to Cairo where the kids ate pizzas and gulped down sodas and chocolates at 9am, but still. Maybe I’m behind the times. Are there vegan school cafeterias in NJ now?? My room, which has my name printed over the door and spelled correctly, is spacious and well-resourced. There is a drama theater with seats that motor back into the wall if you want the extra performing space. I’m floored. I’m sure I’m going to get lost. The director assured us we would all get lost at some point, and not to worry. And why worry when you can de-stress by a turtle pond in one of the three courtyard areas? You know, in case you want to relax and feed some little tortugas. Unless you’d rather rest in the Japanese garden around the corner. Yum. 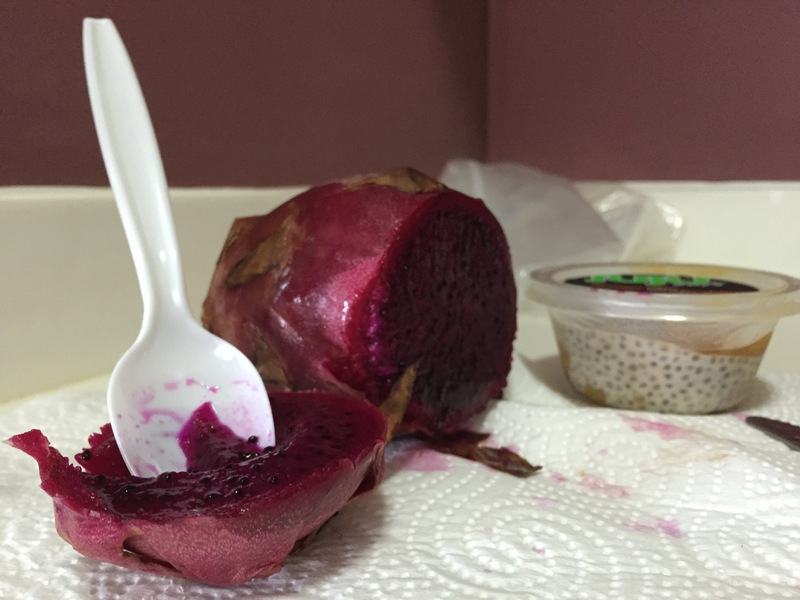 Mango and chia seed pudding from the school cafeteria, and dragon fruit. For a bank operating offline, they did a pretty good job of getting our cards activated and our accounts up. Kudos to you, BPI. 10. Jeepneys. These are everywhere. Apparently they’re old army vans/jeeps that were left behind and converted into public transportation. Microbuses:Cairo::Jeepneys:Manila. The only reason I know about these is from The Amazing Race, when a bunch of contestants crammed into a jeepney and applauded themselves for being ahead of the gang when in reality they were going in the wrong direction. 11. Americanization. I stocked up on American products, but I probably didn’t need to. Yesterday, I joined three other new hires on a trip to the nearby mall, where we ogled at the 5+ floors and found an interactive map at the bottom of the escalator. This information board allowed you to type in what you were looking for or simply scan each floor with a touch of the finger. “They should put one of these in the school,” said Preston, a fellow English teacher. This mall had it all: Tesco products, Topshop, MAC (!! ), American Eagle, Marks and Spencer. All this and a supermarket on the bottom floor. 12. New people. I love meeting new people, but this is probably the weirdest and biggest change of all. For the past three years, I’ve returned to Cairo and to a handful of fantastic friends whose faces I looked forward to seeing at the ACE immediately after landing. It’s one thing to come back to a place and return to hugs and nights out and hours of swapping summer stories over perspiring bottles of Sakara. I miss this. Meeting new people means starting over, and it can certainly be positive, if you let it. I find that I’m constantly making subconscious comparisons to Cairo and telling myself things like, “If I were in Cairo, I could call Myles and go to the ACE for a few hours of catch-up” or “If I were in Cairo still, I wouldn’t have to buy all this crap for my new flat.” It takes a lot to push that mindset aside. Over lunch, we were talking about some article in the school handbook about the stages of settling in to a new country, from excitement to depression to etc. etc. I hadn’t read it. (I also disagree that stages are so finely defined; I’m sliding between excitement and sadness any given hour.) I asked Preston, who’s been traveling the international circuit since he was a kid, what he thought of the advice. He said that while he agreed with some of it, there are other factors. Don’t forget where you come from, and don’t let it get in your way. Thank you! It’s a lot at once, but it’s also a lot of fun. I love reading comments from you! Miss you both!